A few hours back, we have received reports from Clove Technology through Chris Ward that the WHITE version of HTC Sensation XE (Z715e) will soon be available in UK. According to Chris Ward of Clove, the White HTC Sensation XE (Z715e) will be launched on the 20th of February and they have now stocks of the said HTC Android smartphone if you wish to buy or order from their online store. The White HTC Sensation XE that goes with Beats by Dr. Dre Audio earphones is priced at £340 (£408 inc. VAT) or USD $645.22 as of writing this. Pretty much the specifications of HTC Sensation XE is still the same as with the black version which came out last year and this is already available in some of regions, this time on UK. 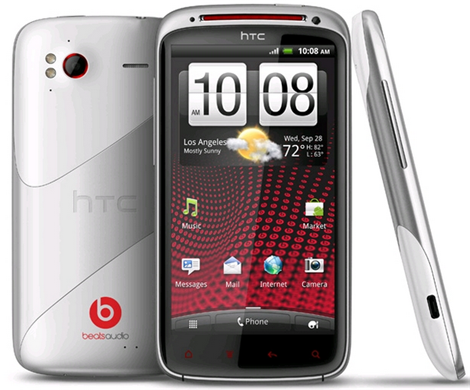 White HTC Sensation XE with Beats audio is also another smartphone that runs on 1.5GHz dual-core processor and the platform it is using is Android 2.3 also known as Gingerbread. It supports quad-band GSM and dual-band 3G networks with 14.4 Mbps HSDPA and 5.76 Mbps HSUPA. The display screen is a 4.3inches capacitive display Gorilla glass. As for the memory storage, HTC Sensation XE has a 4Gb eMMC ROM, 768Mb RAM, plus microSD storage. There’s also a 8MP rear camera and a front camera for video chatting. Here in the Philippines, you can buy the black version of HTC Sensation XE for a price of PhP 25,300.00 when I saw it from CMK Cellphones – an online e-retailer of mobile phones. I am not sure when will there be a white version of HTC Sensation XE but I am pretty sure it will be soon with the same price since the only difference is the color – which looks like more feminine for me. If you are planning to buy the white version HTC Sensation XE with Beats by Dr. Dre and you’re in the UK, then check it from Clove to get more details about the package.